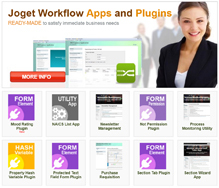 Joget is a clever agile development platform which makes it possible for non programmers to deliver a lot of business functionality in short term. As a Business Analyst I have been able to deliver business solutions within a few weeks, sometimes days, starting with only a global business requirements specification. The online Joget documentation and support forum helped me with a quick start and continued support. I would recommend Joget to anyone searching for a BPM solution that is both flexible and extendable in order to meet all the future needs one organisation may have.